It was with a sense of trepidation and a hint of excitement that I recently flew into Talinn, the capital city of Estonia on the shores of the Baltic ocean between Latvia and Russia. In an unlikely twist, it is perhaps this proximity to Russia which has fostered a Western culture as America seeks trading partners to bolster its pool of allies against a Russian state intent on consolidating power and flexing its military muscle. 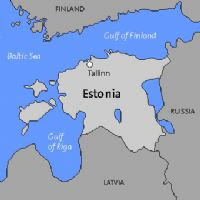 It should also not be lost on even the most casual observer that a large proportion of Russian oil pipelines reach the ocean port in Estonia and that this country of only 1.4 million inhabitants benefits hugely from the oil export industry. It was Gildas d’Ollone, general manager of Chateau Pichon Longueville Comtesse de Lalande, now owned by Champagne house and global distribution giant Roederer, that remarked on the potential of the former Soviet Republics. "Follow the smell of oil" is the advice which made all the sense in the world, but took some time to reveal its intelligence to me. With oil predicted to scale $100 per barrel this year and a recent HSBC report predicting $400 per barrel within the next decade, it makes sense to acknowledge that oil, and its associated support industries are going to drive the creation of unimaginable wealth in the immediate future. Alternative energies notwithstanding, it is still oil which energizes the world and over which, ultimately, wars are fought. So what moral direction does a young wine marketer follow in choosing target markets for luxury wines? Is it morally reprehensible to follow such a crass strategy? Is it wrong to target the wealthy simply because they have the money? The global wine market is still in a state of oversupply which some say will never come into balance. This oversupply exists despite the US baby-boomers urgent attempt to drink as much "healthy" wine as possible in an effort to harness the life-extending properties of this magical elixir. Should we be shamelessly chasing these markets that simply did not exist a decade ago? The answer is, of course, yes. The world is constantly changing, demographics shifting, markets and currencies cycling and tastes evolving. It is the challenge of the marketer to interpret these shifts, to adjust their thinking and to realign their market strategy in tune with the prevailing trend – or fall behind. The emergence of new previously non-existent markets occur in tandem with an ongoing consolidation and increasingly aggressive competition in the established markets which are losing their attractiveness as profit centres. The entrenched weakness of the US Dollar provides challenges to profitability which cannot adequately be solved through price increases or supply chain margin management. A shift in geographical awareness and an "out-of-the-box" look at the new-money markets is something that becomes attractive to the astute student of wine marketing. The wine market does not start in the UK and end in Germany. Estonia is now a member of the EU and will adopt the Euro within 24 months. Perhaps Latvia and Lithuania will too? A 2008 election in the US will almost certainly create a new Democratic government eager to strengthen relations with Russian neighbours and might even look to expand NATO into these former Soviet Republics. This kind of scenario was unthinkable a decade ago and is now being discussed openly as Russian and America face a missile stand-off reminiscent of the cold-war. The world is changing and areas that were formerly off limits have potential to develop rapidly. People with money gravitate towards life’s perceived pleasures like fast cars and luxury goods and we should be positioning to cater to this new demand. Perhaps it is time to purchase an Atlas to add context to the "International page" of Die Burger and allow ourselves to contemplate alternative emerging wine markets more thoroughly? Estonia, Latvia and Lithuania HAVE BEEN MEMBERS of NATO (and EU) since 2004.
checkered history, a list inlcuding Denmark, Germany, Sweden, Poland. Sure, their cultures have been influence by all of these countries but are not derivatives of any 'motheland' cluture. You should really check out Slovakia they love fine wine here, every second person makes their own.